We are receiving supplier invoices in various currencies. We have also installed the exchange rate auto update module (and it works). After registering the invoice in USD (our base currency is EUR), we want to pay it. 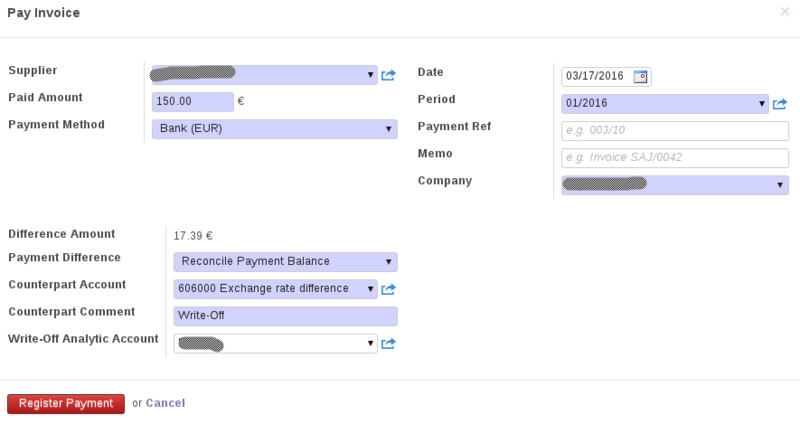 As you can see the payment is in EUR and not in the currency of the invoice. How can we pay the exact amount in the invoice's currency without using a USD journal? So basically have odoo, pre-fill (or something like) the exact EUR amount based on the exchange rate on the day of payment. Or alternately, register a payment after we have paid out the invoice from the EUR account (via CreditCard) and cross check the cost in EUR through bank statements. In Odoo 9 it can be done in one step. The interface provides for that. Not the case in Odoo 8. It seams that the journals in Odoo 8.0 auto acquire the company's base currency, even no currency is set for the Journal (or the bank account). So trying to go through supplier payments, defaults to an equal amount in whatever the base currency is, no matter what the currency of the invoice is. If the invoice is 100USD, and you try to pay that out, Odoo will try to pay out 100BaseCurrency. Apparently it can be done through a different path. If one goes via Suppliers --> Supplier payments, then a payment against any or all journal entries for a specific supplier can be registered. For specific supplier invoice, select the appropriate line (remove the other lines), select full reconcile and the result will be Odoo to convert from the invoice's currency to the base currency (taking into consideration the exchange rates manually or automatically updated). Yes, but if no currency is set, you can post entries in different currencies. The above link will help you how to automate your currency rate and how to use different Bank Journal to maintain your record. And following link help you how to use multi-currency in your system. You will end up in the hell of mess if you refuse to use appropriate accounts and journals and try to fiddle around with exchange rate conversions. If you receive a bill in USD you have to pay it in USD (and not in converted EUR) and it has to be registered as such as long as there are no other agreements with your supplier. Please ask your accountant for a proper setup. A simple hint to make your life easier: do not define a currency for your bank account or for the corresponding journal. Thank you for your reply. Our concern is related to the fact that all currencies are paid out via our EUR account. We guess (combining what we read in the link provided bellow by Nilim) that not setting a currency for the bank account is part of the solution? BTW No accountant involved yet. Believe it or not, no one felt brave enough to deal with a small company having a dominant currency other then USD. So the next question is, any link to provide "Accounting with Odoo for Dummies" style info? Thank you for your time. The size of the company does not matter, you need somebody with serious accounting knowledge anyway, and you do obviously do not know enough about accounting in order to ensure proper multi-currency accounting even if Odoo helps a lot with automagic exchange difference posting when set up properly. Thank you very much. Useful. Though we will try it our selves, do you happen to know if this applies to v8 which is the version we are using?